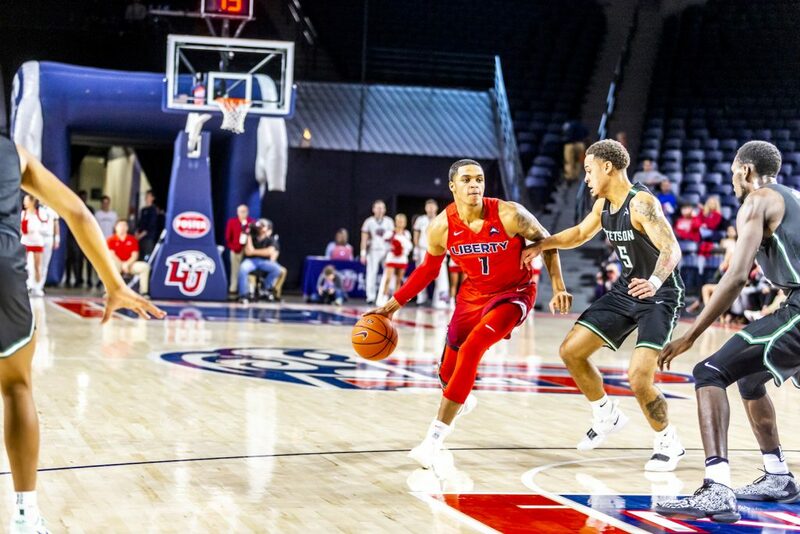 The Flames survived a late scare against Stetson Tuesday, Feb. 5, scraping a 57-54 win at the Vines Center in Liberty’s first game this season decided by a single possession. When junior guard Caleb Homesley dunked with 2:22 left on the clock, the score was 57-48, in favor of the Flames. Liberty would not score again, however, and Stetson’s relentless pursuit of the Flames came short of a major upset by only one missed 3-pointer as the buzzer rang. The win qualified the Flames for the ASUN championship and took them to 20 season wins in the fastest time in program history. In the night’s standout performance, senior guard Lovell Cabbil led the game with 19 points, but he was disappointed by the team’s poor execution. Coming into Tuesday’s game, the Flames 71-53 win away at Stetson in January, combined with Stetson’s poor conference record of 1-8, pointed towards a comfortable win for Liberty. On a night of poor shooting, however, Liberty struggled on offense throughout most of the game, shooting for .379 from the field and missing 25 3-pointers. ATTACK — Redshirt junior Caleb Homesley drives toward the basket past a Stetson defender. 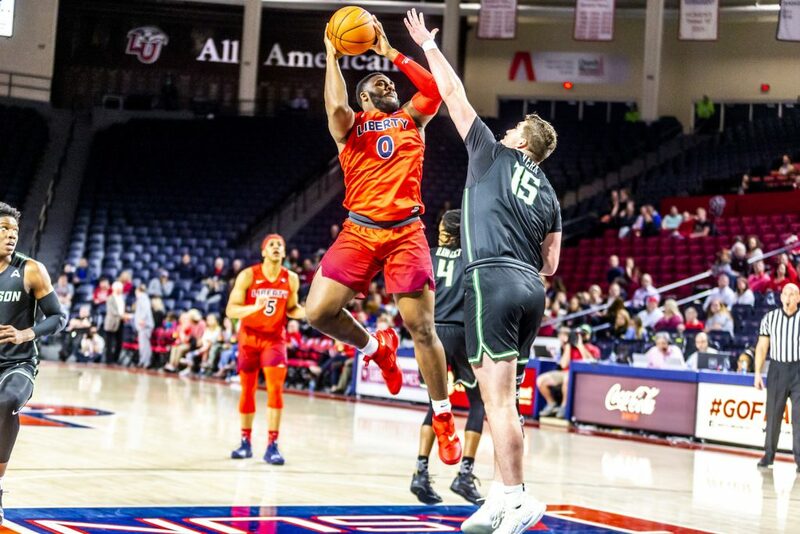 Throughout the first half, Liberty and Stetson traded points, setting the pattern of ineffective offense that would last for the rest of the game. By the under-16 media break, Liberty was 2-6 from the field, leaving Coach Ritchie McKay frustrated. Possession also changed hands regularly in an increasingly sloppy first half, with both teams combining for 15 total turnovers and 37 missed shots from the field. POWER— Red-shirt junior Myo Baxter-Bell shoots over a Stetson defender. The Flames seemed lifeless before sophomore guard Keegan McDowell rose to score a 3-pointer at 13:26, ending a nearly 4-minute scoring drought for Liberty. Cabbil added 5 more points in a 10-0 run that would swing momentum in Liberty’s favor, leaving the score at 46-34. Stetson kept pace, however, narrowing the gap and then launching into a 6-0 unanswered scoring run, knocking on Liberty’s door as the score reached 57-54. McKay paced the sidelines as his players struggled to defend in the final minutes of the game. As Keith Matthews missed his chance to tie the game at 0:01, the buzzer rang, leaving the Flames clutching to a win that had almost slipped away. Cabbil reflected on the reality check Tuesday has been for the Flames. Liberty has a tough couple of weeks ahead as they travel to take on Lipscomb, North Alabama and North Florida. The team’s second matchup against Lipscomb will be high-stakes as Liberty looks to reclaim its spot at the top of the ASUN. The Flames will be in the Vines again Tuesday, Feb. 26 when they host Kennesaw State at 7 p.m.